ATEN is known throughout the industry for providing efficient, stable, user-friendly KVM solutions. ATEN also provides patented KVM cables that offer higher quality signal integrity features than the ordinary cables commonly found on the market. 1. A wide variety of connector interfaces to meet a wide variety of market requirements: No matter if your clients require PS/2 or USB connectors for the keyboard and mouse; or a D-SUB or DVI interface for the video, there is an ATEN KVM cable to satisfy their needs. 2. A wide variety of cable lengths to choose from: ATEN offers cables in a variety of lengths (1.8, 2, 3, 5, 6, 10, 20, 30, and 40 meters) to cover just about any cabling requirement. Note that not all models come in all lengths -- please refer to the KVM cables page for cable availability details. ATEN KVM cables use braided cover-shielding (as shown in the diagram), whereas generic KVM cables are merely covered with a flat sheet of aluminum foil. In comparison with aluminum foil, the braided shielding provides stronger radiation resistance while lowering electromagnetic interference. 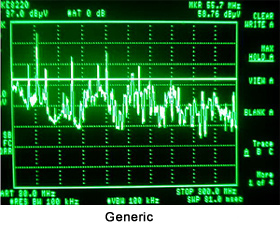 Use of braided shielding prevents electromagnetic noise that results from high frequency signals, as well as prevents external sources from interfering with signal transmissions. 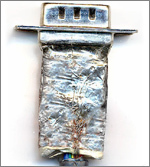 Internal cables are covered with aluminum foil and insulating material to shield the analog signals from digital signals and prevent crosstalk. Generic cables, on the other hand, only use rubber sleeves -- permitting high interference between the analog and digital signals resulting in poor signal quality. 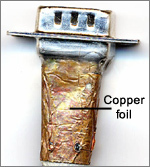 ATEN connectors are encased in a layer of copper foil in addition to the usual tin plating. This greatly reduces electromagnetic emissions, thereby reducing possible health hazards. By contrast, generic KVM cable connectors are only plated with a layer of tin and are not nearly as effective in reducing electromagnetic leakage. ATEN KVM cable connector screws are long and thin for easy installation and removal. Generic cable screws are thicker and shorter which are harder for users to reach and turn. ATEN KVM cable connectors have an SR (Strain Relief) design and are not easily pulled away from the cable. They can secure the cabling and limit pull to the connected units. 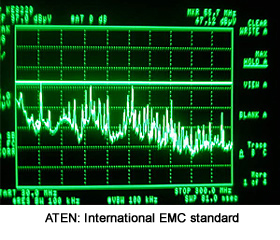 EMI testing: EMI test data shows that ATEN KVM cables conform to international EMC standards, with a lower risk of radiation hazard. 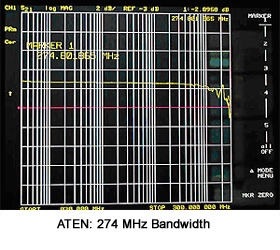 Cable bandwidth testing: Test data shows that ATEN KVM cable bandwidth can reach up to 274MHz (pix Frequency). This allows higher resolution output and finer image output. 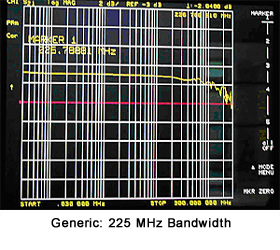 Generic KVM cables, on the other hand, are only capable of 225MHz(pixel Frequency) bandwidth, and are unable to attain the higher resolution output that ATEN KVM cables can. 4. Environment Protection & Safety: ATEN KVM cables conform to EU RoHs regulations and do not contain hazardous materials. ATEN strives to comply with RoHs regulations, as well as the hazardous chemical laws and regulations of client countries and importing nations. From research and development of all product series, to supplier selection, purchasing, material inspection, leadless processes, product evaluation and process flow standardizations, ATEN continues to improve and maintain its business under the guidelines of this specific directive. A higher quality KVM switch deserves to be paired with a higher quality cable in order to achieve true high quality signal transmissions. With ATEN KVM cables, signal deterioration is reduced and image output appears true to its original form. Choosing ATEN KVM cables to match your ATEN KVM switches provides the best KVM solution you can achieve.